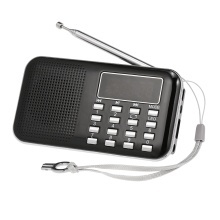 Y-896 Mini FM Radio Speaker is specially designed for people who are free to listen to radio, weather, and news at home. Loud sound and high fidelity sound quality makes you enjoy favorite music at anytime and anywhere. It is really cool and trendy to enjoy music with this multi-functional stereo digital speaker. With high-quality FM Radio signal, mini radio speaker can search channels automatically. Number buttons are for MP3 selection and FM Radio station easily. Direct manipulation and get started quickly. Loud sound and high fidelity sound quality is perfectly suitable for the aged. It&apos;s also available for earphones connected with 3.5mm earphone jack. As a speaker, it can play music from TF card and U drive. In MP3 mode, it can play the song that was played before the last shutdown when it was restarted. With 2 inch display screen and unique plastic buttons, user-friendly, durable and eco-friendly. The attached lanyard is convenient for you to take outside.